Another post?! *fist-bump* I realized I haven't done a Quickie Swatch segment in a month so I thought I'd get my rear in gear. February was a short month so that's my only defense, haha. Today's Quickie Swatch is... Should I even make an excuse now? You guys should know what to expect... It's another Stardust Polish! I'd like to state as a disclaimer this polish was purchased by me and I'm not in any way being biased with my reviews towards this indie. Now let's get to the swatch photos, shall we? 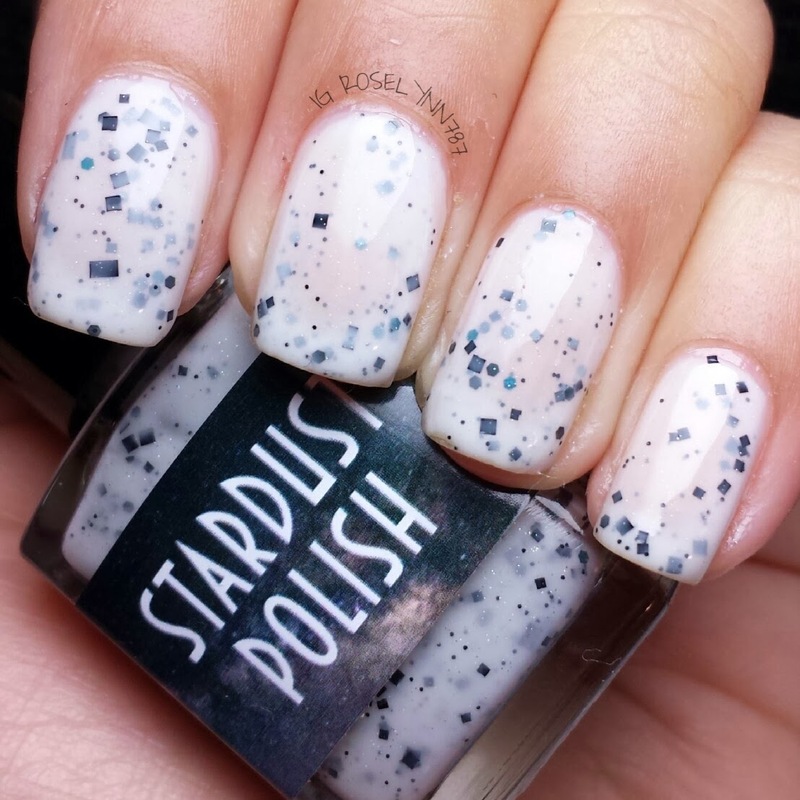 This beauty is Mrs. White by Stardust Polish, part of her Clue inspired collection that was released a few months ago. Swatched over a clear base, used two thin coats, and sealed with I'm on Top topcoat*. 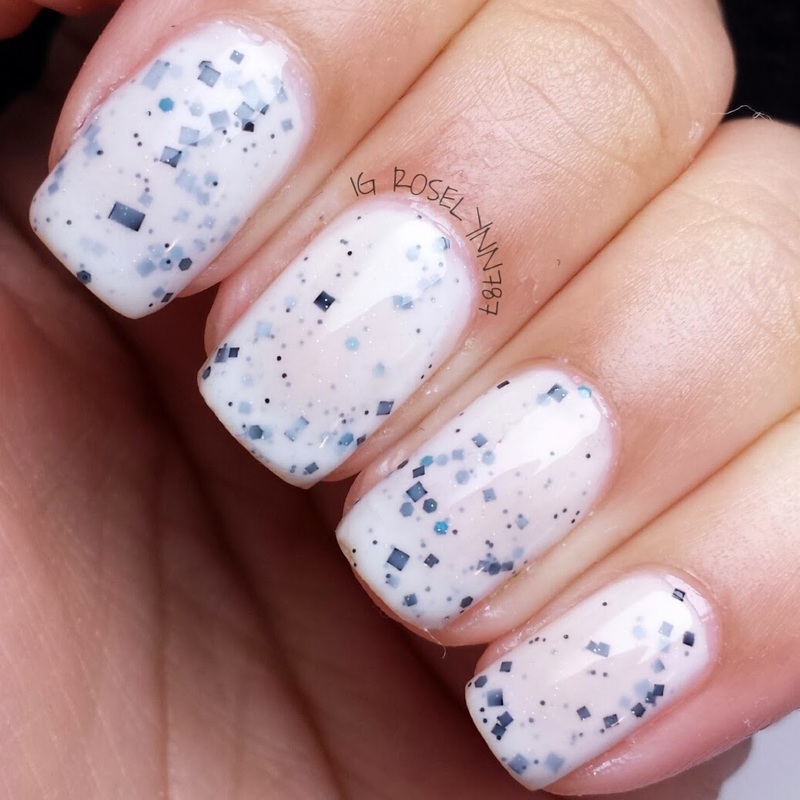 Mrs. White is a white crelly with a slight shimmer and filled with black square and hex glitters. This polish is sheer in one coat but you'll accomplish full opacity using two thin coats. I didn't use an undie and don't feel it's necessary for this polish. I absolutely love how simple but classy this polish looks. It works great as a base for some charms (as seen in this morning's post) or as a base for some nail art as well. The application is perfection, as always. Very smooth to apply and no glitter fishing whatsoever. With one stroke I got the majority of the glitters desired for one nail. I didn't have to put the bottom upside down, just had to shake it well before use. I've had this bottle for a few months sitting in my helmer and it's as if it was freshly made. No 'goob' or thickness in anyway. Not much else to say about this beauty except that you definitely need to add it to your collection. 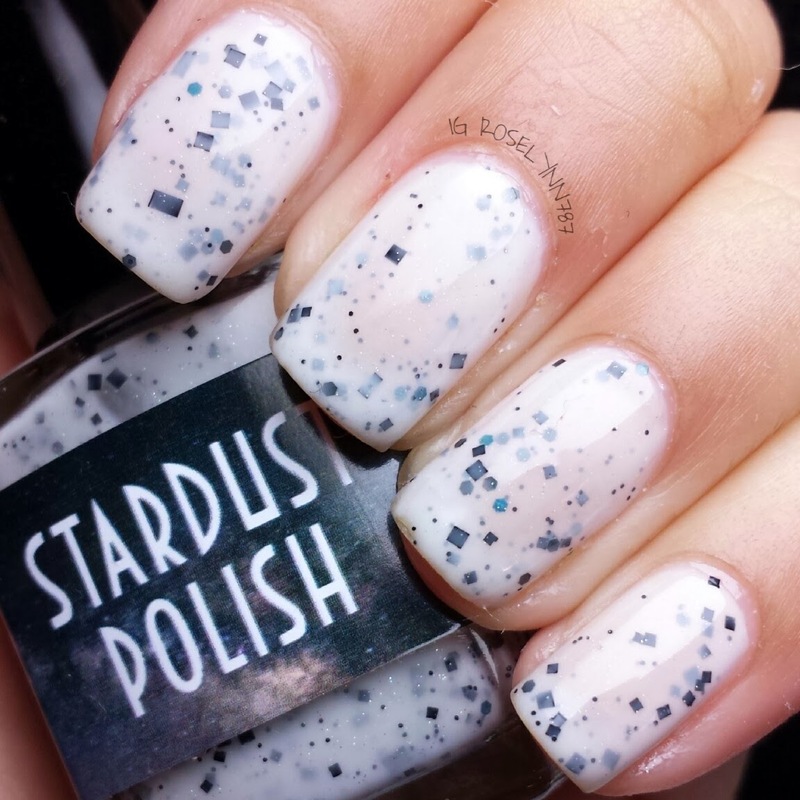 Check out Stardust Polish and browse her great selection over at http://www.stardustpolish.bigcartel.com/. *I'm on Top is a glossy topcoat by Oh So Naughty Nails. This swatch is part of a two week trial period using this topcoat. Full review will be available at a later time. I really enjoy your manicures! 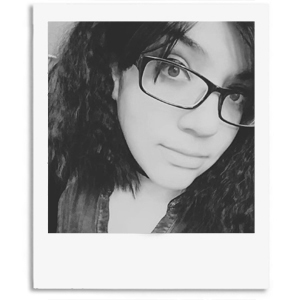 Here is my site so we can follow each other! Hi there, thank you for stopping by :D I love the Bright Side Hop, lots of great reads there. And I'm glad you like my manis. Will definitely return the love and follow back. I really like that! I love that kind of polish, but I don't love how hard it is to get off my nails. It's like those little flakes superglue themselves on! Any tips on how to get if off easier? Hi there. Glitter polish can be quite tricky to take off and used to make me not want to put it on at all. There are a couple of solutions I'll cover in a later blog post but I use a base coat that makes it easy for the glitter polish to 'peel' right off when I want it to. There is also a new peel off base coat that was just released by OPI, I haven't been able to purchase it yet but once I do I'll definitely make a post. I use a bonding base coat. Maybe that's contributing to the problem then.